As I've remarked many times before, I sure love a good coffee truck. There's nothing like a vehicle completely outfitted with top-level coffee equipment, quality beans and an able barista, able to go where the wind (and city permits) allow. Taking the usual coffee truck operation to the next level by roasting their own beans, Rival Bros came onto the Philadelphia scene recently with strong promise of stupendous, locally-roasted coffee straight out of a mobile joy machine. Sadly, in all of their existence I've only been able to reach their encampment twice; once on First Friday (when I snapped the shot above) and the most recent, a week or so ago at 33rd and Arch on the Drexel University campus. Pulling up to the intersection near the Buckley Green, there was plenty of meter parking for those looking to pull over for a nice respite (though I'm sure more of their patronage arrives on foot). I approached and ordered a pourover of the Ethiopia Aylele – YCFCU and an espresso of their Whistle and Cuss blend. The pourover of Ethiopian roused even the dead amongst my taste buds, with notes of Stella D'oro breakfast biscuits, succulent steak, fuji apple, honey and roasted red pepper, proving to be a beautifully savory and sweet coffee with a nice medium body. The espresso, pulled short with a brown crema, greeted with an uppercut of lemon, cocoa, ginger soda, red bean paste roll, a touch of salt and a nice milkiness. Both drinks proved to be worthy of an exaggerated curtsey. 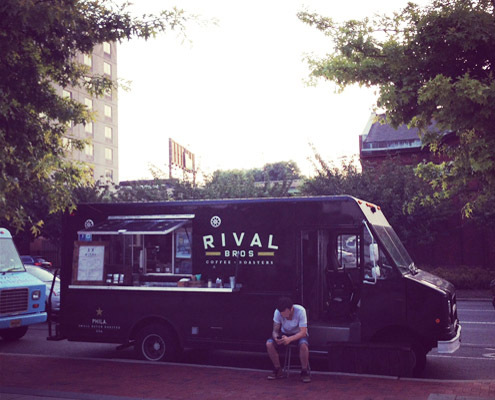 While Rival Bros is definitely not a truck found on the same routine every week, they're easy enough to find via their twitter. Thus, when you're in Philadelphia, hunt down the likes of the Rival Bros. I love the idea of coffee trucks. They are getting pretty popular in Brisbane.